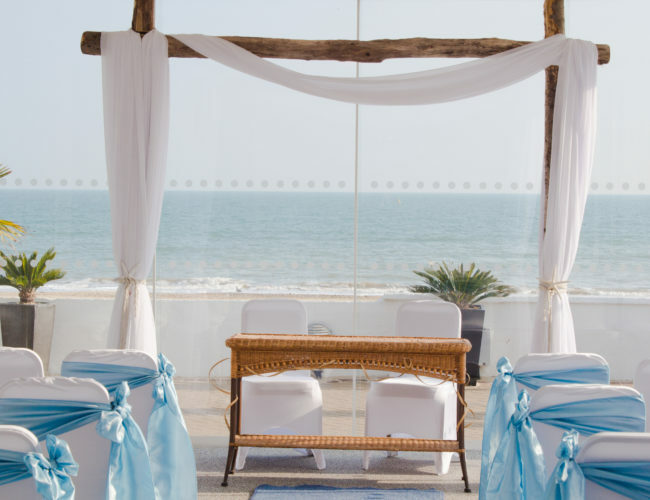 If you’ve always dreamt of a beachfront wedding, the Sandbanks Hotel has it all. Situated on the world-famous Sandbanks Peninsula, it’s just a few steps from terrace to sand. 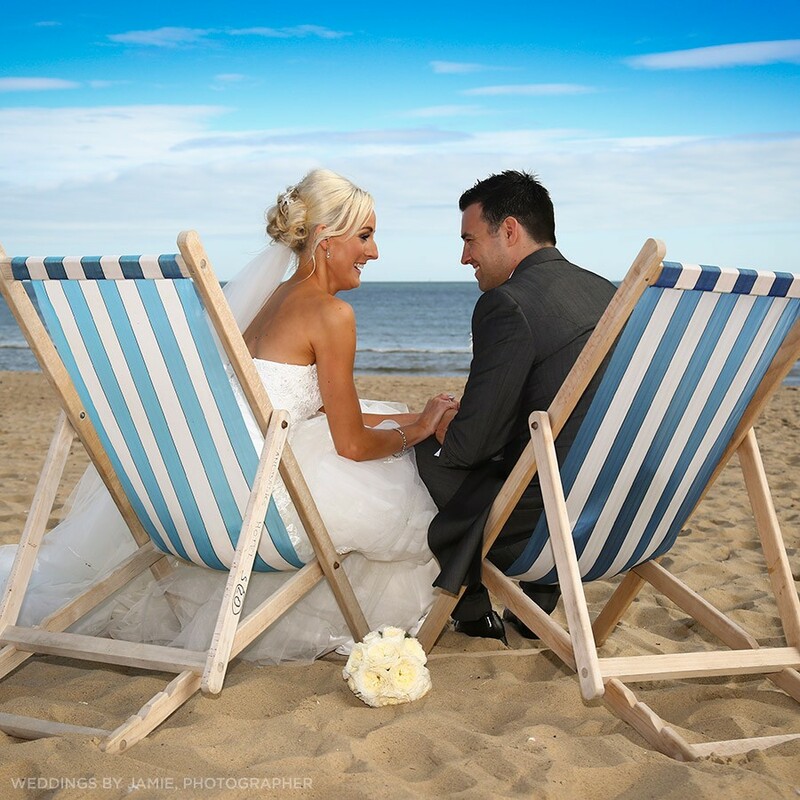 A fantastic opportunity for you and your guests to spill out onto the beach for photos. 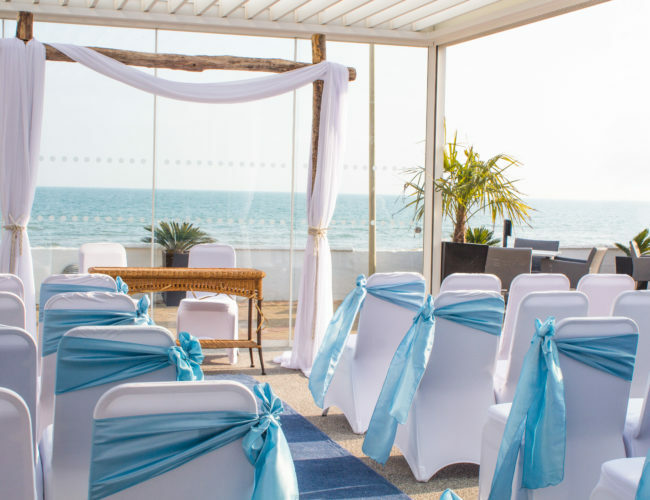 With panoramic sea views stretching to the white cliffs of Old Harry Rocks, this is a dramatic and romantic venue for your big day. 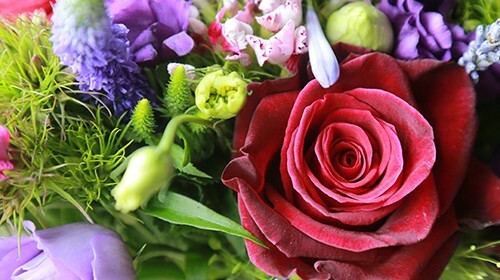 Plus an enthusiastic team including wedding planners, who currently hold the Dorset Wedding Supplier’s ‘Wedding Planners of Year Award’, are here to help ensure that your special day is a success. 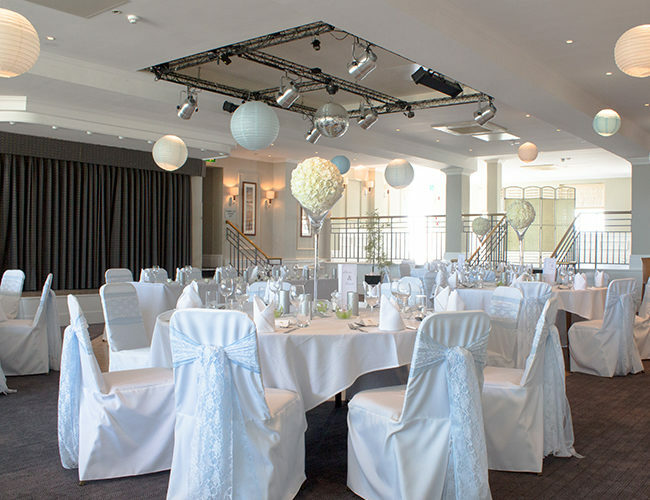 Weddings at the Sandbanks Hotel are available until October 2019. With the beach in reach, we have to make the most of this picturesque setting. 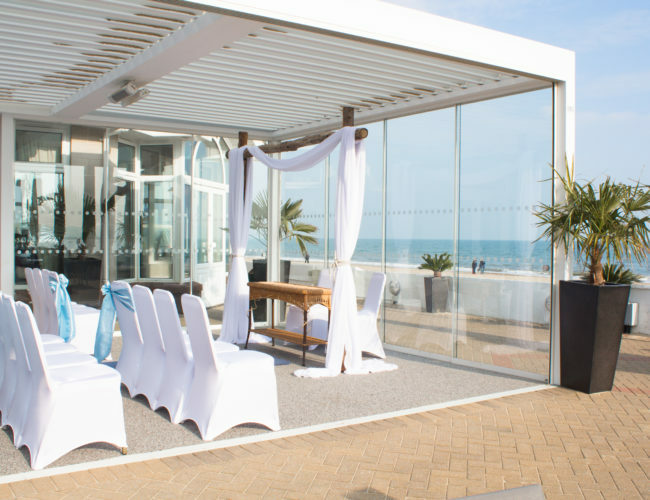 For intimate weddings, the Sandbanks Hotel offers a unique chance to have an alfresco ceremony on our covered terrace. With panoramic sliding windows and optional tilt ventilated roof, you couldn’t say your vows closer to the beach. Welcoming up to 80 guests, our covered terrace offers built-in heat systems for Winter Weddings or chillier days. 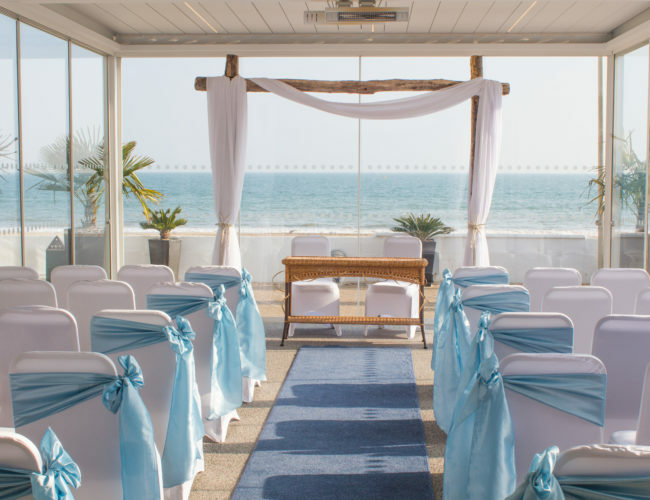 This is the perfect beach-side location for ceremonies for all seasons. Thank you to Sebastien and Lauren for all their hard work. You guys have been amazing and so accommodating. You made it easy for us and we didn’t feel stressed at all. Thank you for an amazing day, Sebastien and everyone else working was great. The whole day went so smoothly, the food was delicious and the setting fantastic. Would recommend Sandbanks hotel to anyone. A fantastic wedding day. Sebastien and Lauren and whole the hotel staff were amazing, we couldn’t fault anything. Thank you. A wonderful day at a wonderful venue, overseen by some brilliant staff. 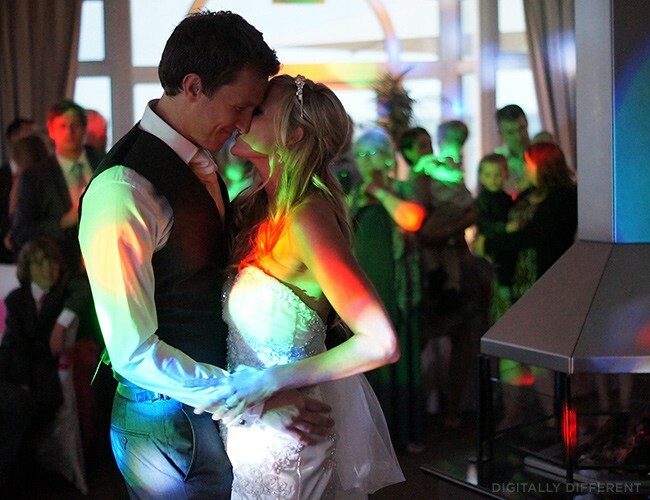 Thank you so much to everybody, though especially Lauren and Sebastien for helping top make our wedding day so special. We had the perfect day, our wedding was amazing. Lauren and Sebastien were excellent and made sure we had our dream day. Thank you so much for everything. 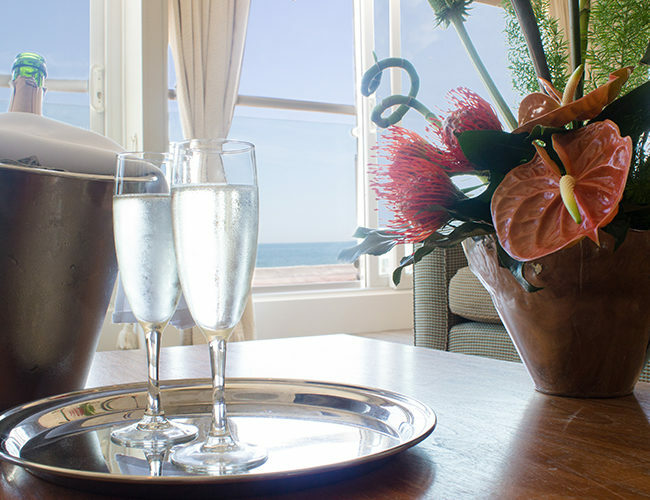 The Peninsula Suite offers a refreshing blend of elegance and informality, complimented with extensive large windows over-looking both the harbour and sea. 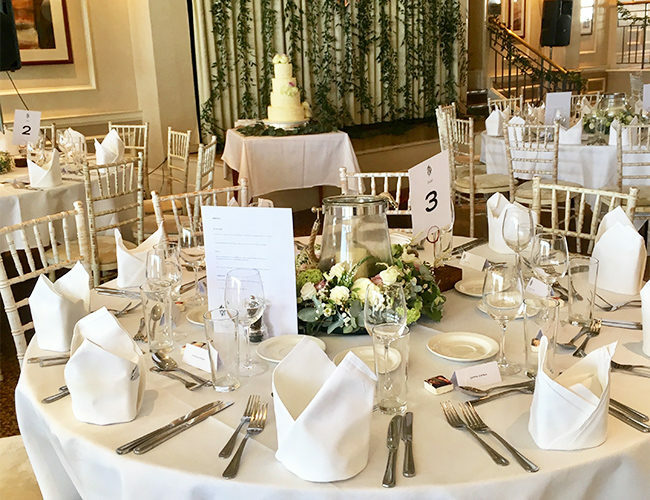 Perfectly formed, complete with upper and lower seating areas offering the happy couple optimum views of their whole party whilst seated. 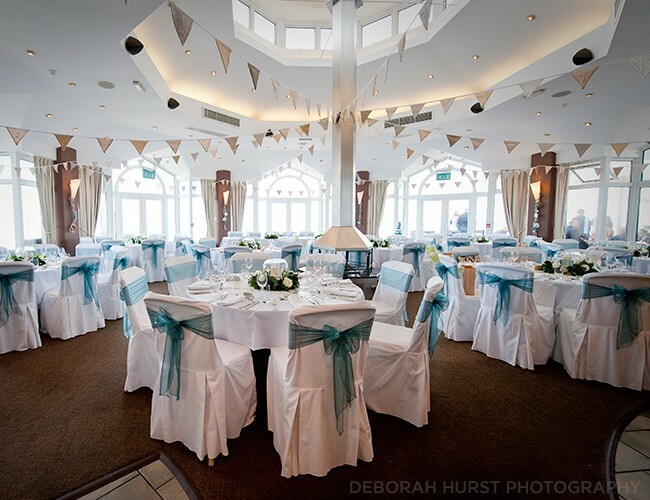 For smaller weddings, the room can be stylishly split with a lounge area – versatile to your wishes or theme. This generous sized suite is completely self-contained with private bar, elevated stage and dance floor. The suite will comfortably seat up to 140 guests; with an option to extend numbers for the evening to 200 guests. The suite will comfortably seat 100 guests, with a chic fireplace in the centre to add an ambient glow to your wedding breakfast. For evening celebrations this suite can comfortably accommodate 150 guests. For dining within this particular suite uniquely offers a Chinese banquet menu consisting of four delicious courses chosen by the happy couple. Guests will enjoy an array of tasty Asian dishes authentically cooked on-site in our very own dedicated Chinese kitchen. 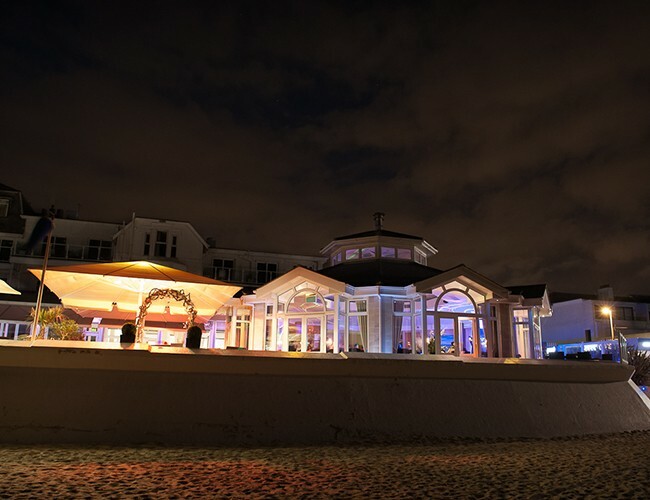 As the sun sets over the sea, the Sandbanks Hotel’s stunning wedding suites offer magical venues for your first dance. 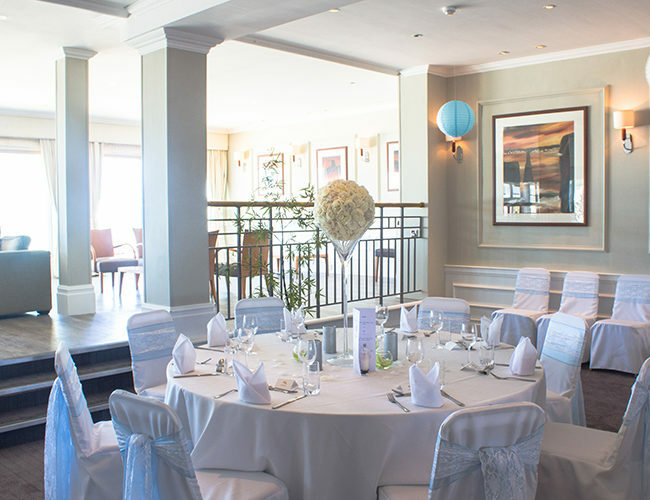 The Peninsular Suite with it’s prestigious stage, dance floor and self contained bar; whereby the Compass Suite offers you breathtaking dusk sea views dance floor and private terrace. There’s plenty of space for a DJ or band – an ideal opportunity to put your personal touch to the evening entertainment for you and guests. 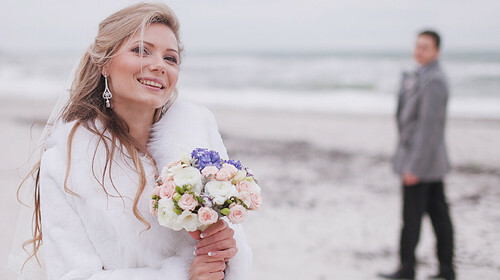 Contact our Weddings Team for further details. It’s always nice to retreat up to bed after a night of celebrating! 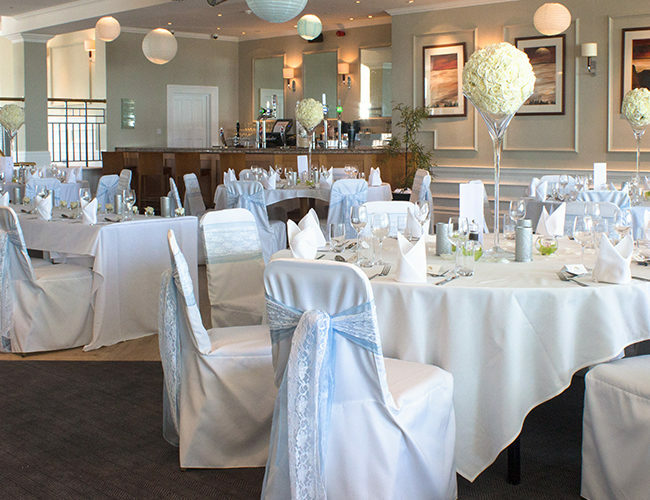 The Sandbanks Hotel offers 105 beautifully appointed bedrooms, many of which have balconies and fabulous sea views. Plenty of room for friends and family to stay the night! 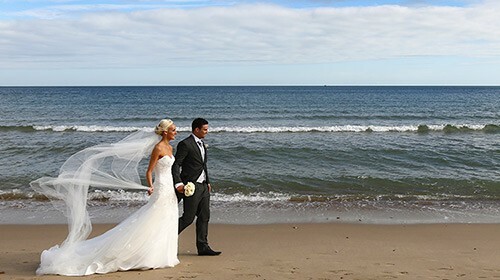 For an extra special start to your marriage, why not spend your honeymoon in the luxurious surroundings of Sandbanks Hotel? 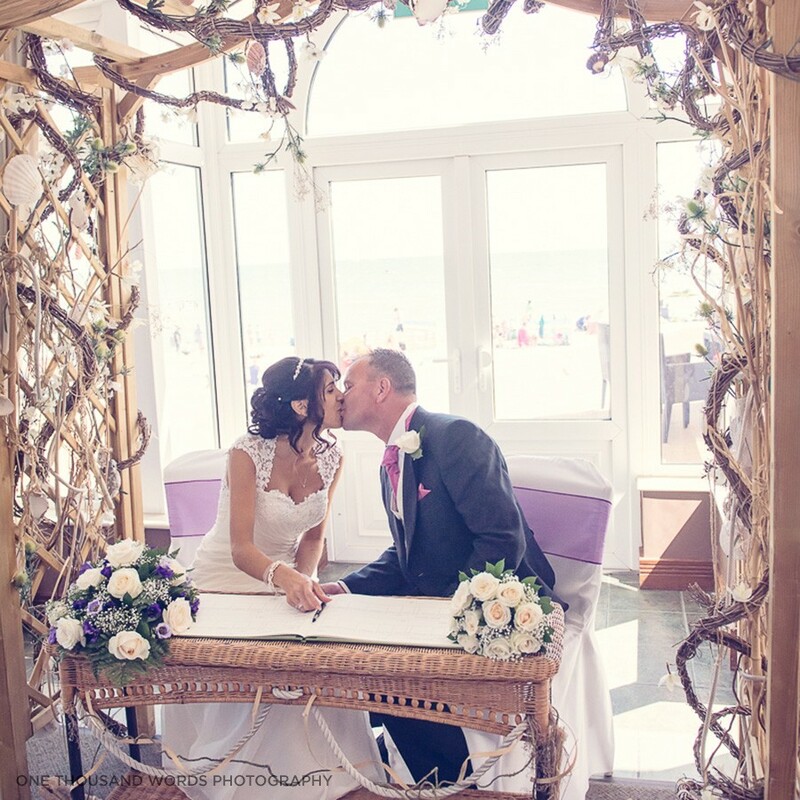 Gemma and Sebastian Lowtoo got married at the SANDBANKS HOTEL last year in July - this is their story.